As a recognized leader in classic residential, hospitality and commercial interior design, Joanne integrates into her practice beautiful aesthetics combined with sustainable elements, while remaining true to her classic sense of design. 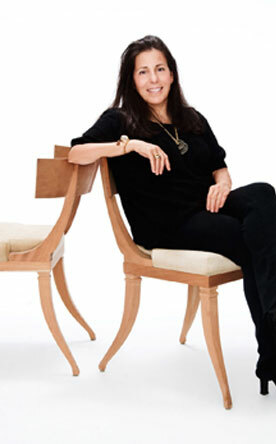 With an in-depth knowledge of the metal arts, Ms. De Palma personally modeled all of the pieces in her hardware line. Her carpet, hardware and furniture collection honors the creative flow of the artist, the social ramifications of the manufacturing process, and her awareness of the environment throughout the entire design process. At a pinnacle moment in her career, 12 years ago, Ms. De Palma began studying with indigenous people around the world, which helped her reconnect to the earth from an appreciation she had gained as a child in the Adirondack Mountains with her grandfather. At that time, she could no longer continue to do business as usual. Knowing her industry was on the precipice of change, coupled with the guidance of a sudden, perceptible internal force, led her to make a shift in the direction of her design practices. Ms. DePalma’s projects range from country estates and farm houses to glamorous apartments and island resort homes, including flagship properties for companies such as as Tiffany & Co. and Four Seasons Hotels. A Pratt Institute graduate, Ms. De Palma started her career at the side of the illustrious Melanie Kahane. She led the exclusive Decorator’s Club into the 21st Century as President from 1999 to 2001. Founded in 1914, she was one of the youngest presidents in its history.